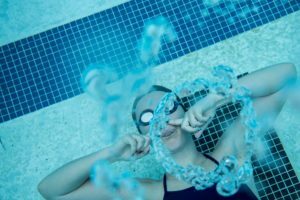 This week’s set from Clarke Dolliver, graphic designer and digital marketing at FINIS, Inc., challenges the swimmer to delay breathing until certain strokes of the exercise. Kieren Perkins was the dominant distance swimmer of the 1990s, with multiple world records and Olympic gold medals to prove it. Here’s the legend’s advice on how swimmers can get mentally tough. Fitter and Faster Swim Camps are being added each month. Go to the Fitter and Faster website to search for camps in your area. Are you looking for a swimming camp this summer? See 36 “Swim Camps” you might love to attend. by Olivier Poirier-Leroy. 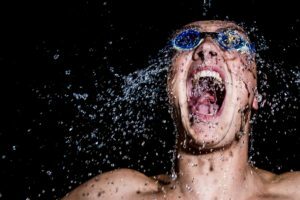 Join his weekly motivational newsletter for competitive swimmers by clicking here. Last summer in Rio we saw one of the strangest and funniest moments in Olympic swimming history. In the ready room before the men’s 200m butterfly semi-finals Chad le Clos of South Africa, the man who out-touched Michael Phelps in the event four years ago, got up in Phelps’ eye-line and performed a series of shadow boxing moves, high paced arm shakes, and more, clearly trying to distract Phelps. In what became known as #PhelpsFace, the greatest swimmer of all time showed not only his displeasure with le Clos’ antics in the ready room, but beat him in that semi-final and then again in the final the following evening to take back Olympic gold in the event. In other words, despite all the pressure Phelps was already feeling in that moment, on top of le Clos’ attempt at psyching him out, he stayed mentally tough and got the job done. And while it’s great to see Olympians being able to exhibit large amounts of mental fortitude, it can be tempting to think that just because we aren’t at that level that we couldn’t benefit from the ability to focus and perform under pressure. 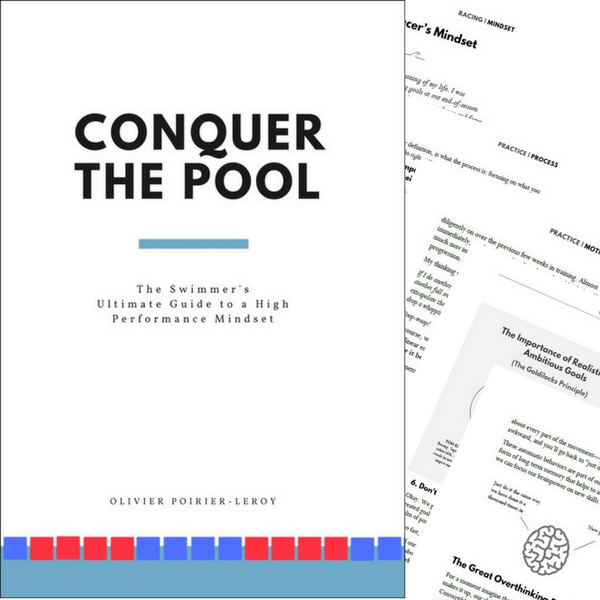 Whether you are an inspiring Olympian or not, working on your mental training can yield a heap of benefits both in the pool and in the rest of your life. 1. It will teach you to master your mindset. One of the challenging, and ultimately rewarding parts of working with young swimmers is showing them that they have the ability to dictate their mindset. Once they get it, they get it, and it’s like a dam is burst and a lot of great things begin to happen very quickly. Mastering your mindset removes that awful feeling of a performance not being in your control (or the way you react to it). For swimmers who struggle with anxiety before big races, or who give up because a set is “impossible”, or who feel overwhelmed by the enormous amount of work required to achieve their goals getting a grip on the way they choose to react to things makes things a whole lot easier. 2. Set way better goals. The truth is, most of us stink at setting goals. We create lofty targets without a realistic plan to achieve them. We underestimate the work required. Or the goals are so obscenely awesome that we quickly feel overwhelmed by them. Working on our mental training includes learning how to set goals the right way. This means setting goals that are realistic, while challenging, and most importantly, building a plan of action. 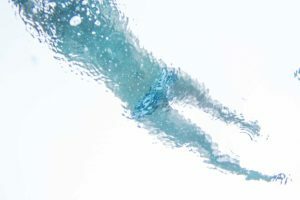 It’s that last part that has the peculiar effect of making you feel like you are in control of the process, and goes a long way in helping you become a more consistent swimmer in the pool. 3. Manage stress and arousal levels. If you’ve ever spent the night before a big race wide awake, or been out-of-control anxious behind the blocks to the point that it hindered performance you understand how infuriating it can be to let stress negatively impact performance. Spending time trying out different techniques to increase and decrease arousal levels means that you can get better at turning up the dial when you need some intensity, and perhaps more importantly, how to turn it down when you are getting a little too worked up. 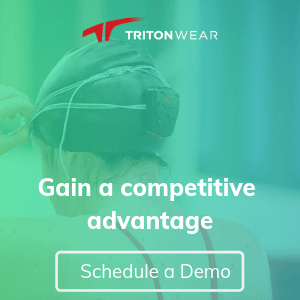 We all face stress in our lives, and when we understand how to combat it with tried and proven tactics and methods we not only are able to perform better in the water, but are better equipped to deal with the day-to-day stresses that we face. 4. Bounce back from adversity. Wanna know what the big difference is between the best athletes in the world and the rest? It’s not talent, or genetics—although those things certainly help. It’s how top champions are able to be resilient in the face of setbacks and adversity. When you master your mental training failures don’t derail you—they somersault you into doing things better. Similarly, when you are injured, it can be really hard to stay positive and motivated—being mentally tough insures that you follow through with your rehab and come back with vengeance. 5. Teaches you to make your success a process. Great athletes have great routines. Sure, they start with a goal, but the focus becomes the process, or the routine that is required for them to achieve the things they want. 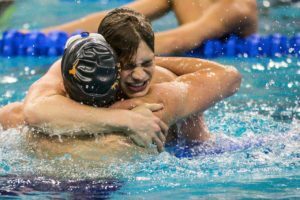 From breaking down their goal into actionable tasks, to scheduling training and planning the high-impact parts of their swimming (nutrition, etc) great swimmers insure that success is in their hands. Regular mental training shows you how to become process driven. It teaches you to set a pre-workout routine, to having mantras and powerful and positive self-talk to help push you through tough times. 6. Increased levels of awareness. Each time we go to practice there is an internal monologue that we use. Whether it’s good, bad, funny, dry or even harsh–we all have it. And for most of us, the things we tell ourselves go without much notice; we are simply reacting to things based on the way that we have in the past. We assess our performance, our effort, and praise or scorn ourselves, often without realizing it. And if you are like most athletes who don’t manage their mental training, and by effect how aware they are of their performance, this means that you often underrate yourself and gloss over the things you do well. While there is no replacing practice that is well executed, there is great value in positive self-talk. 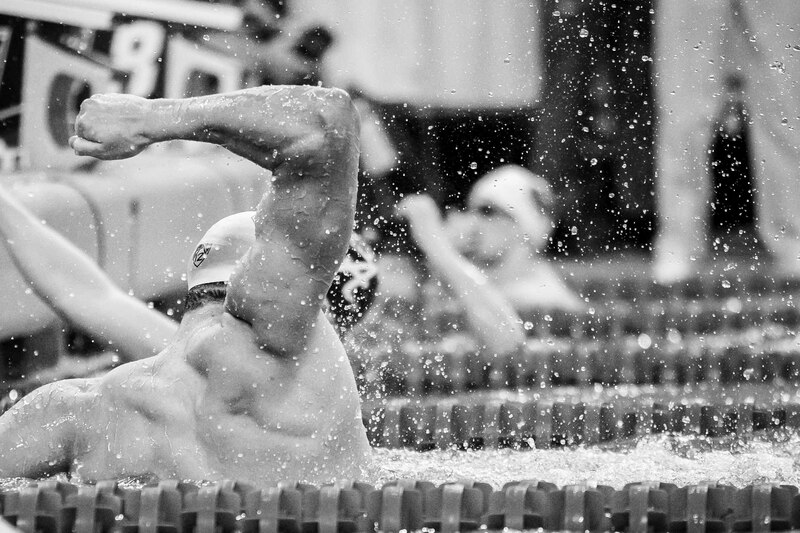 It’s one of the tools you can lean on when you are neck deep in a tough set. The reality is that our thoughts influence our actions. Being aware of the monologue you use while training and in competition means that you can help influence your eventual outcome as well. 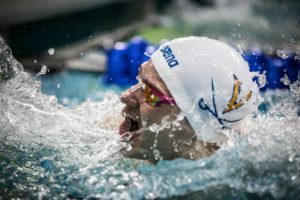 Perhaps the biggest benefit is that these skills—goal setting, mastering self-talk, visualization, being able to face up to adversity—is applicable to life outside of the pool as well. No matter how ambitious your goals in the water are, these skills will serve you well on dry land as well.